Laurel Wilt Disease of Florida Avocado? Laurel wilt is a lethal disease that spreads rapidly among root-grafted avocado trees and for this reason necessitates frequent scouting to detect symptomatic trees and immediate tree removal to stop spread to adjacent trees. 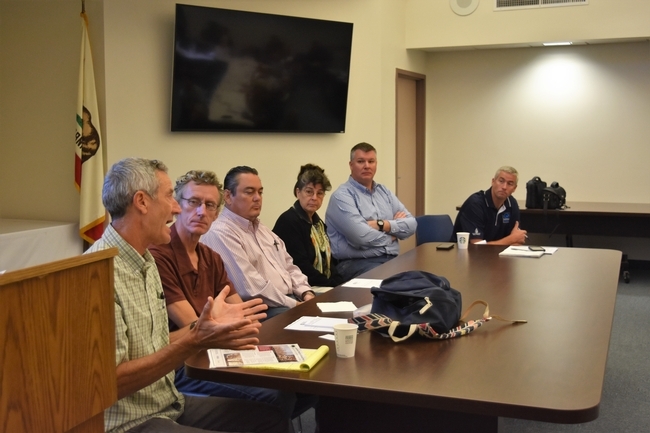 The research on the management of the laurel wilt pathogen and several ambrosia beetle vectors is continuing, therefore, recommendations for mitigation and control may periodically change. This document describes the current recommendations to limit or prevent of the spread of the laurel wilt pathogen among avocado trees and to control the ambrosia beetle vectors of the disease. In addition, alternative management strategies concerning re-establishment of productive groves are discussed. 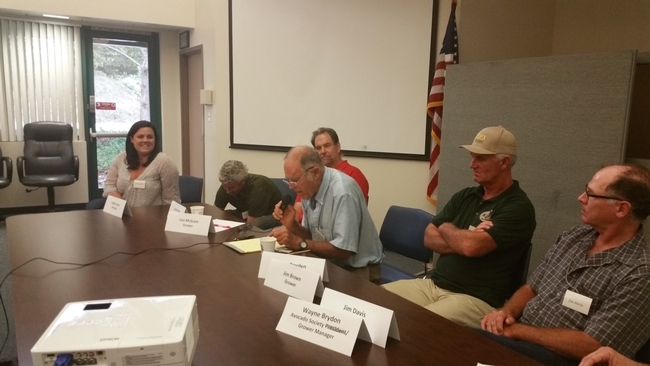 If you have trees symptomatic for laurel wilt please contact Don Pybas, LW Coordinator, (305- 247-0848; pybas@ufl.edu) or Jeff Wasielewski, Commercial Tropical Fruit Crops Extension Agent, (305-248-3311, ext. 227; jwasielewski@ufl.edu) for more information. The earliest external symptom of LW is green wilted leaves in sections of the canopy. However, green-leaf wilting is quickly followed by desiccation and browning of these leaves, which remain attached to the plant stems for up to 12 months. Stem and limb dieback follow and eventually additional sections of the tree decline and the tree dies. Underneath the bark, the normally cream- white sapwood may have dark blueish-black streaks. Frequently, trunks and/or limbs may have numerous small diameter holes with sawdust tubes (toothpick-like protrusions from the bark), and/or sawdust clinging to the bark which is evidence of ambrosia beetle activity (i.e., boring into the tree). Frequent scouting to detect trees with green leaves beginning to wilt (i.e., early symptoms of LW) and their immediate uprooting and destruction. Infusion or injection of Tilt® fungicide into all the trees in a grove before a LW outbreak occurs. Repeated applications at an 8 to 18 month interval are necessary. Of the two strategies mentioned above, the early detection-immediate destruction method is the most economical. Repeated infusion of fungicides may cause damage to the trees at the infusion sites and therefore may not be sustainable. In contrast, there is antidotal evidence that repeated injections are less damaging to the trees but there is a lack of information on the long-term sustainability of this method. A helicopter survey implemented by the Avocado Administrative Committee was important in alerting the industry and growers to new areas of potential LW infestation and is now important for monitoring on-going infestations. However, helicopter surveying is expensive and not frequent nor detailed enough to detect early green-leaf wilting caused by laurel wilt. Scouting frequently is key in detecting LW affected trees at the green-wilt stage. Ground-based scouting by driving through groves via equipment (e.g., tractors, mowers, and spray equipment), trucks, and ATVs is possible. However, detecting early symptoms of LW in the tops of trees may be difficult by just driving. An alternative is the use of drones, which can cover large areas quickly, and in detail. However, there are Federal Aviation Administration requirements and regulations that must be met in order to operate commercial drones. Canine detection of LW is an additional detection method. The canines detect the LW pathogen in pre- and fully symptomatic (e.g., desiccated leaves, tree dieback) trees. 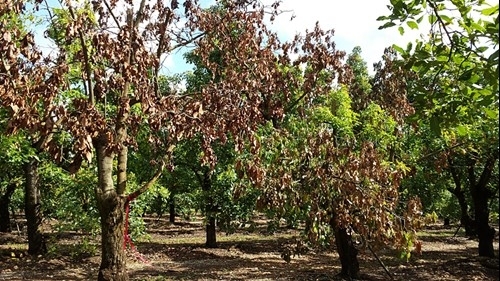 In many cases, fungicide infusion of infected but pre-symptomatic (no outward signs like wilting) trees allows these trees to remain productive, however fungicide re-treatment is necessary. In addition, early detection by canines provides time to remove pre-symptomatic trees to prevent further root graft spread of the pathogen to healthy trees. The number of available trained canines and for some producers, the cost, may limit the use of canines. The major component of LW control is to remove and destroy LW affected trees at the green- wilt stage. 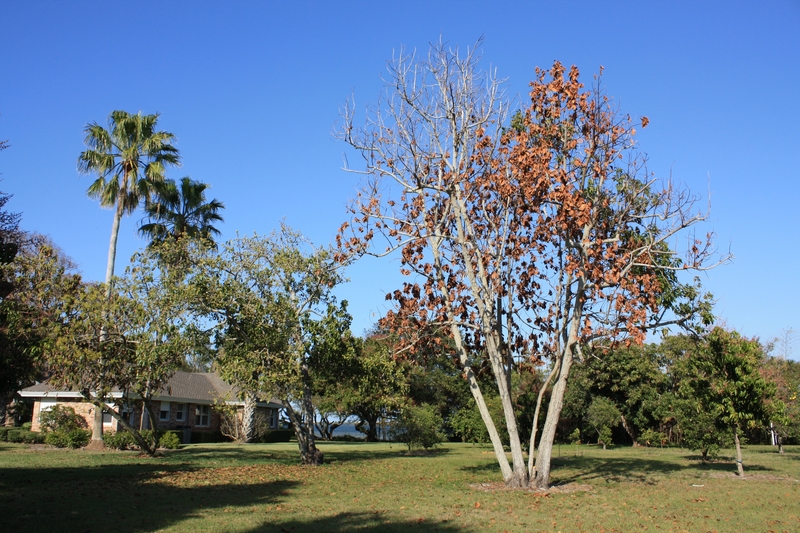 Do not hesitate to remove and destroy a green-leaf wilted tree – waiting to see if more of the tree canopy develops symptoms or turns brown allows time for the pathogen to spread to adjacent trees through their connected root systems. Waiting to remove and destroy the LW affected tree reduces the chance tree removal alone will stop the spread of the LW pathogen to neighboring trees. The LW pathogen can survive in declining and dying trees and the only way to stop movement of the pathogen to adjacent trees is to remove (uproot) affected trees immediately. Just stumping or hatracking LW affected trees will not stop the pathogen from moving to adjacent trees through root grafts among adjacent trees. In addition, trees that are affected by LW are very attractive to ambrosia beetles. If these ambrosia beetles come into contact with the LW pathogen inside the tree, these beetles and their offspring may be contaminated with and spread the pathogen to more trees and groves. Therefore, proper destruction of LW affected trees is an important component for reducing the spread of this disease by root grafts and by ambrosia beetles. Remove the entire tree by pulling or pushing. Pushing trees over before tree destruction is easier than trying to dig or uproot stumps from the ground. Once the tree has been removed, it should be chipped or burned. High powered front-end grinders are now in use which quickly chip the entire tree including the trunk area. Alternatively, wood may be chipped and wood too large split then chipped or burned. Call FDACS-Div. of Forestry at 305-257-0875 or 954-475-4120 for permission to burn (burn permit). Wood cut into smaller pieces will burn faster and more completely. The large wood may need to be burned more than one time (restack to expose non-burned wood) in order to be destroyed. Treating the tree stump (or stumps) with insecticides does not prevent the emergence of ambrosia beetles, which are already inside the tree and after a few weeks does not prevent further ambrosia beetle infestation. Thus, the best method to prevent beetle emergence from this wood and new boring into the wood is to dispose of the wood by chipping and/o rburning. Ambrosia beetles are attracted to avocado wood chips and leaving them untreated or not burned results in increased activity of ambrosia beetles in the grove. Wood chips should be spread out, not mounded, and thoroughly sprayed twice, 7-days apart, with an approved insecticide (e.g., Hero®, Talstar®, Malathion, Danitol® or Agrimek®), plus adjuvant (i.e., NuFilm®, Vapor Gard® or Pentrabark®). 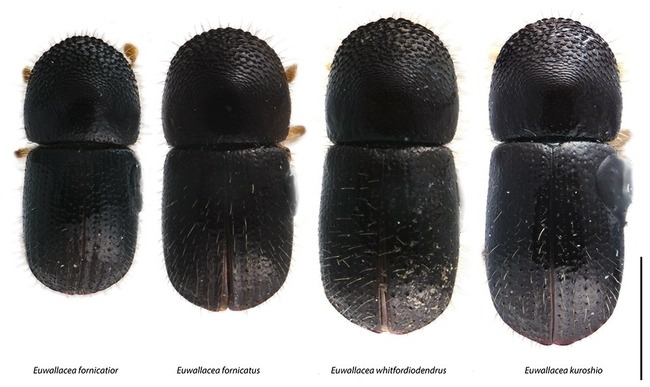 Some biopesticides (e.g., BotaniGard) have also been shown to kill ambrosia beetles as well. Avocado groves under organic production should chip and burn all wood. At present, there are no fungicides that cure LW-affected trees. The fungicide Tilt® (propiconazole) can be used, but it must be inside the tree before they are infected with the laurel wilt pathogen. Currently, Tilt® is the only labeled fungicide approved for laurel wilt control on avocado trees. Tilt® can only be used in commercial operations and is not approved for use by homeowners in their landscapes. 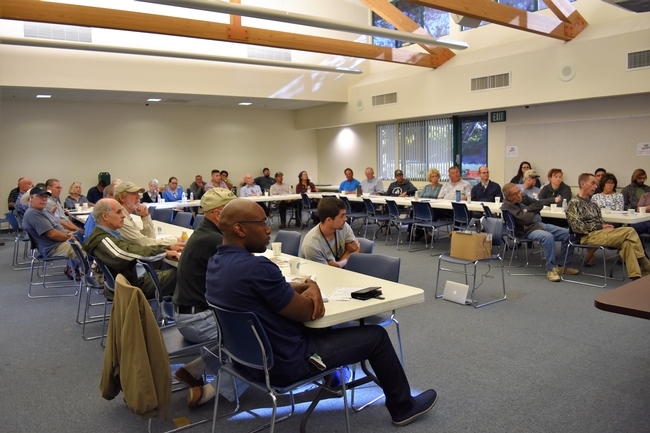 When using Tilt®, growers must have in their possession the Section 18 special local needs label (SLN); go to http://www.syngenta-us.com/ or contact Jeff Wasielewski, Commercial Tropical Fruit Crops Extension Agent, (305-248-3311, ext. 227; jwasielewski@ufl.edu). Infusion. Infusion consists of diluting the Tilt® with water and either passively or under pressure infusing the mixture into the flare roots at the base of the tree. Infusion of Tilt® must be repeated every 8 to 18 months. While effective, the infusion method causes damage to the flare roots making re-treatment difficult. Therefore, this application method may not be sustainable. Injection. Injection consists of injecting the tree along the trunk and the major scaffold limbs using undiluted (or slightly diluted) Tilt®. Injection of Tilt® must be repeated every 12 to 16 months. Although a substantial number of groves have been treated in this manner, whether this method is sustainable in the long-term is not known. Prophylactic treatment of groves, whether by infusion or injection, can be costly. As such this strategy if chosen is best suited for groves with varieties that generate relatively high returns. Spot treatment. This is a combination strategy of early detection of LW symptomatic trees and treating by infusion one to two healthy trees adjacent a LW affected tree in an effort to prevent root movement of the LW pathogen to healthy trees. However, the key to success with the spot fungicide treatment is early detection of trees with symptoms of LW, their immediate uprooting and destruction and immediate infusion with Tilt® fungicide to the healthy adjacent trees. Although the spot treatment method is generally less costly than treating an entire grove approach, it may not be sustainable because of the damage to the flare roots caused by the necessity of repeated fungicide applications. The largest portion of the ambrosia beetle population is inside infested trees. Contact insecticides will not prevent ambrosia beetle emergence from already infested trees or wood. Chipping and burning wood are the only ways to eliminate ambrosia beetles inside tree stumps and wood and stop their reproduction. To suppress ambrosia beetles active in the environment after chipping and/or burning infested trees, applications of contact insecticides and/or biopesticides to about one acre of trees surrounding a LW affected tree is recommended. 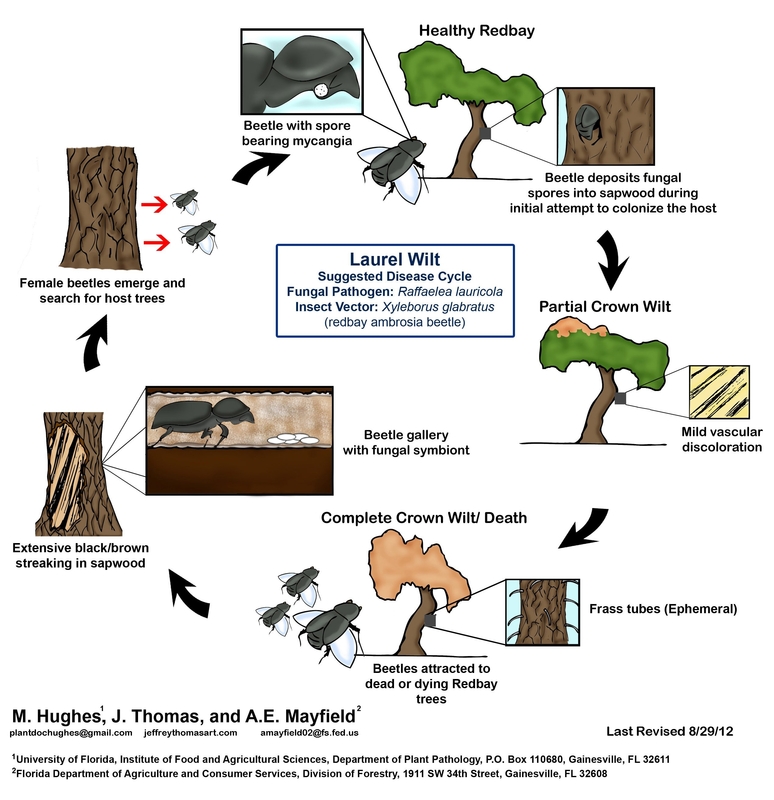 After removing LW affected trees, make two applications of insecticide directed to the trunk, scaffold limbs and medium to large wood (not the foliage) of adjacent trees at a 10-15-day interval. The spray should be bark directed spray to the lower part of the tree and not the leaves and upper canopy. 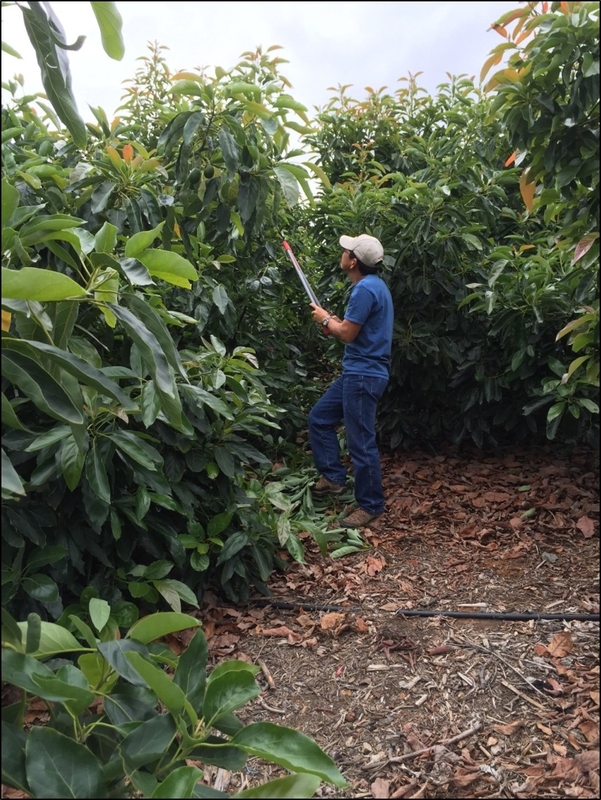 Malathion, Danitol® and Agri- Mek®SC are registered for bearing avocado trees. In order to reduce the chances of beetle resistance these products should be rotated (Table 1). For Malathion and Danitol® use an adjuvant such as NuFilm® to prolong the efficacy of the insecticide. Do not use sticker-type adjuvants like NuFilm with Agri-Mek®SC use a non-phytotoxic, non-ionic activator type wetting, spreading and/or penetrating spray adjuvant or horticultural oil (not dormant oil) – see label for details. Do not use Vapor Gard® and Pentrabark® adjuvants as they may cause phytotoxicity on leaves. For non-bearing avocado trees, Talstar®-S and Hero® may be applied (Table 2); use an adjuvant to prolong their efficacy. or Bb) are registered for avocado and have been shown to provide some ambrosia beetle control. The strategy is to attempt to suppress the ambrosia beetle population increase, which occurs during the spring. Research has shown trunk directed applications of Bb are capable of killing ambrosia beetles and the time-line for application of these materials is February through May when average temperatures are lower and beetle populations are increasing. However, proper trunk and major limb directed application is paramount for Bb to be effective. The concept is to place live Bb spores on the main trunk and scaffold limbs where ambrosia beetles may contact the live Bb spores. First, compatibility of Bb with other spray materials varies. A general recommendation is to clean spray tanks prior to tank mixing. Bb is not compatible with some fungicides (e.g., Abound® and Switch®) and insecticides (e.g., Danitol® and Malathion) (Table2). Spraying Bb too close to an application of a non-compatible spray material application will reduce the effectiveness of ambrosia beetle control. Therefore, time Bb applications toh ave the most time before and after any potential non-compatible spray material is used. Only purchase what will be used immediately. Do not leave these bio-insecticides in the tank for prolonged periods since it will kill the active Bb spores. Also be sure to store BotaniGard® ES and Mycotrol® in a cool, dry place that stays between 40°F and 85°F – otherwise the Bb spores will be killed. 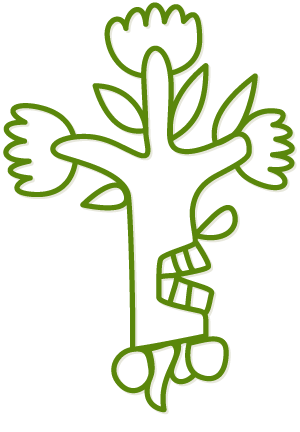 Mix the BotaniGard® ES and Mycotrol® in sufficient water to ju st wet the trunk and major limbs. Do not spray to run-off as this causes the Bb spores to wash off the bark. A light but thorough wetting is ideal. In general, ambrosia beetles are attracted to areas of low light levels (i.e., shade). To reduce the potential for ambrosia beetle attack, selective pruning and/or annual or biannual topping and hedging should be practiced to increase light levels within the grove and tree canopies. Ambrosia beetle control is a part of the strategy to control laurel wilt. 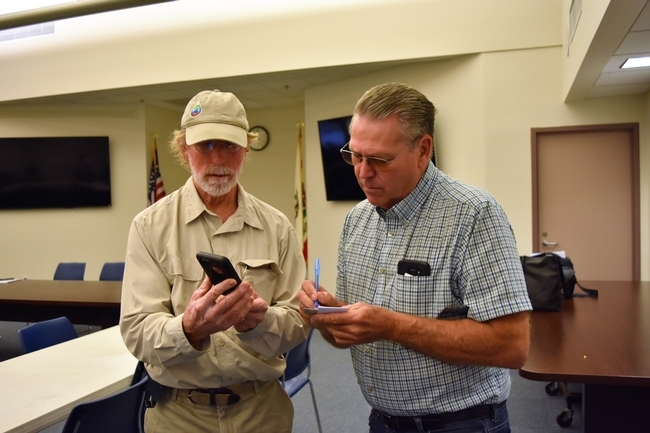 However, it is imperative to implement early scouting for laurel wilt symptomatic trees and for tree removal and destruction to occur quickly. 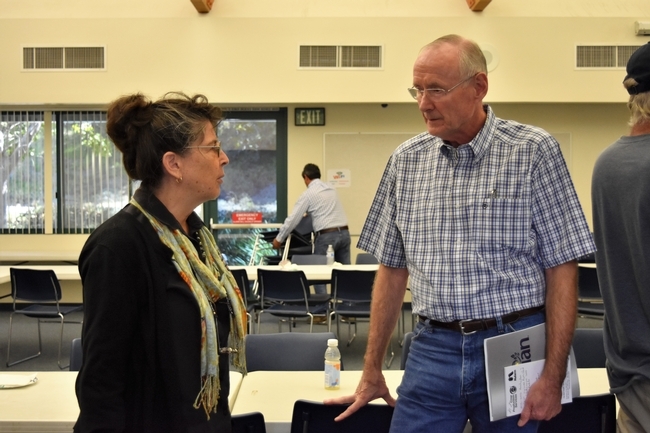 Strategies to suppress the ambrosia beetle population include selective pruning and/or regular topping and hedging to reduce the shading within and among avocado trees. This may reduce the attractiveness of trees to ambrosia beetles. Actively controlling ambrosia beetles in the immediate vicinity of an active laurel wilt outbreak may reduce new laurel wilt outbreaks. 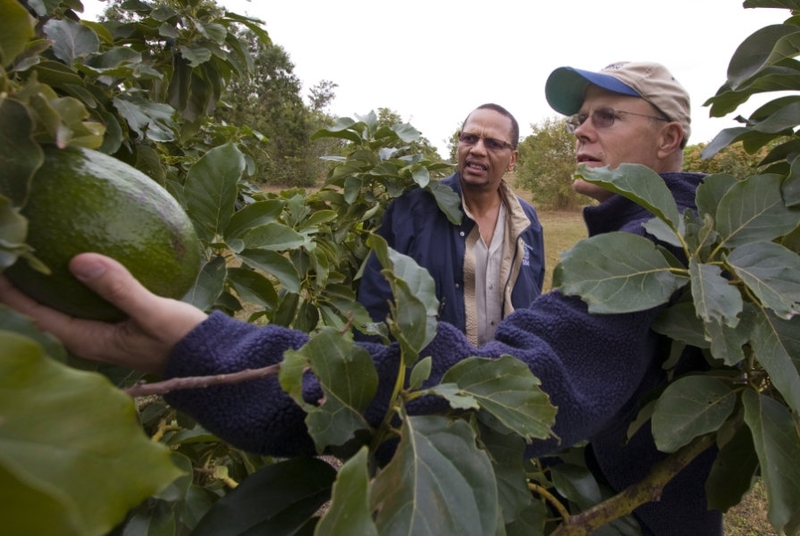 Economic modeling indicates that early detection and removal of the infected avocado tree (primary strategy) plus replacement (i.e., replanting) provides the best option for the operation to remain profitable. Immature trees are less likely to be attacked by ambrosia beetles and are not root grafted to adjacent trees. Harvesting can commence from third or fourth year. Stump healthy trees to 3 to 5 ft in height (~$25/tree) and allow trees to resume production. Alternatively stump trees and topwork (~$35/tree) trees to a more profitable cultivar. 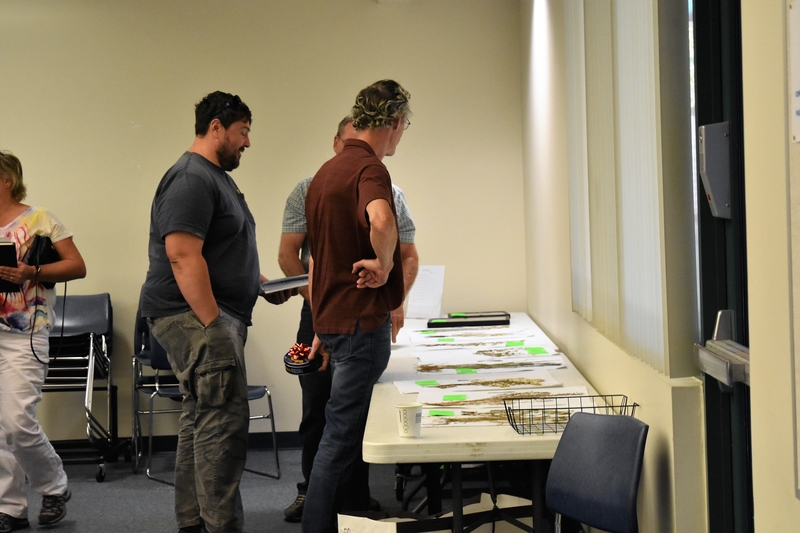 Production may resume in 2-4 years depending upon cultivar and production practices. Their production level will be at a higher level than young (1-3 years-old) trees. The drawback for maintaining these older trees is they remain root grafted to adjacent trees and LW could move from tree to tree via the root system. It is not recommended to stump LW affected trees to topwork. Remove a block or grove of old avocado trees (~$50/tree) and replant avocado trees (~$30/tree) with a more profitable cultivar. 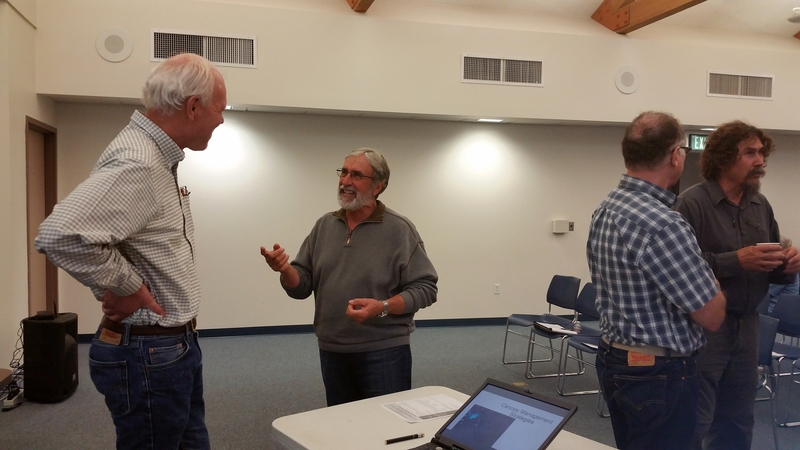 To establish a new grove estimated to be ~$8,000/acre. The advantages to removing mature root-grafted avocado trees and replanting to young avocado tree includes: (1) young trees are less attractive to AB (small diameter trunks and lots of light in grove) and (2) young trees are not and will not be root grafted to adjacent trees for years – so LW pathogen cannot spread tree to tree by the roots. This strategy buys time to find better control solutions to LW-AB. The disadvantages to remove and replanting with young trees is the cost of removing old trees and replanting with young trees, fruit production will not begin for 3-4 years, and will not be substantial until 7-8 years. Remove trees (~$50/tree) and enter an alternative agricultural business or fruit crop. Table 1. Contact insecticides for ambrosia beetle control. Direct applications to the trunk and medium to large wood to about one acre of trees surrounding the LW affected tree. Rotate pesticides products reduce the potential for insect resistance. MixDanitol®,Malathion and Hero® with anadjuvant (e.g.,NuFilm®) to prolong their efficacy. ForAgri-Mek®SC do not useNuFilm® or similar, use a non-phytotoxic, non-ionic activator type wetting, spreading and/or penetrating sprayadjuvant or horticultural oil (no a dormant oil) – see label for details. The biological control insecticidesBotaniGard® ES andMycotrol® do not need anadjuvant and should be stored in a cool (<85°F), dry place. x, Special Local Need (SLN Section 24C): y, Only for non-bearing trees; do not apply within 1 year of harvest; z, The estimated days of efficacy is influenced by numerous factors including weather conditions (e.g., rainfall, temperature, and UV light intensity). 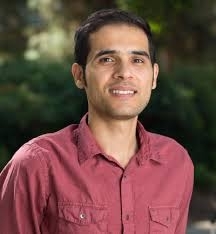 Amir Haghverdi: Assistant Cooperative Extension Specialist/ Scientist of Integrated Urban Water Management at UC Riverside. 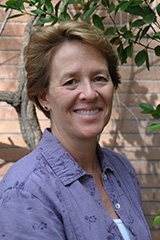 Peggy Mauk: Director of Agricultural Operations/Subtropical Horticulture CE Specialist. 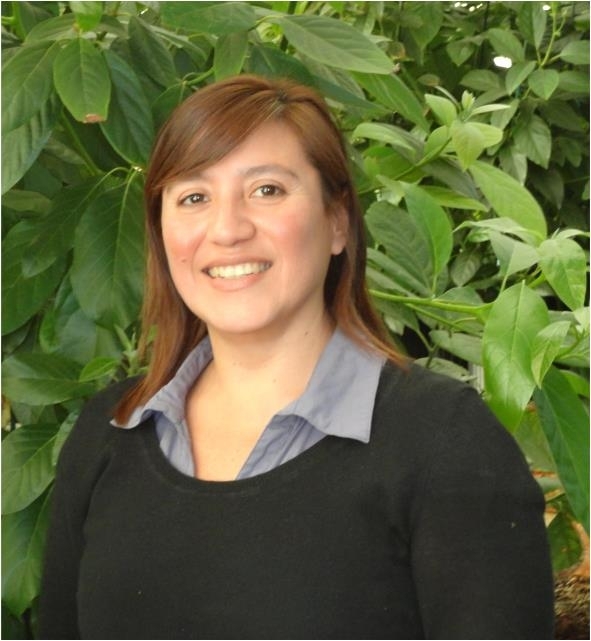 Patricia Monosalva: Assistant Professor of Plant Pathology and Director of the UCR Avocado Breeding Program at UC Riverside. 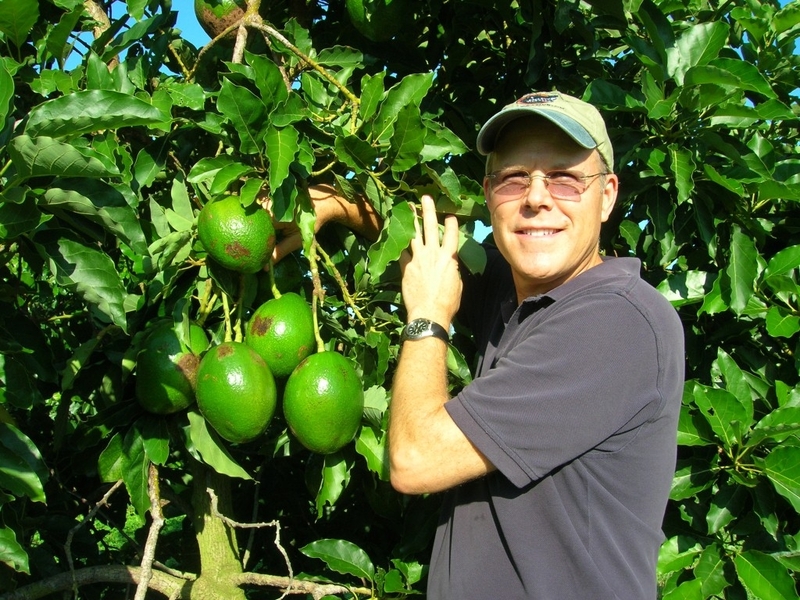 Speakers: Jonathan Crane and Team: Tropical Fruit Crop Specialist at University of Florida.